CICM 2010 is now over. See the photos of the conference. 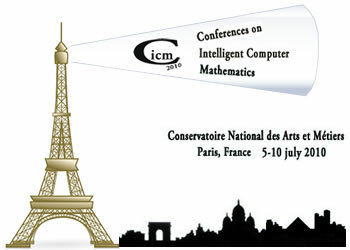 After CICM 2008 in Birmingham and CICM 2009 in Grand Bend Ontario, the 2010 edition of Conferences on Intelligent Computer Mathematics will be held in Paris during the week starting monday July 5. The Intelligent Computer Mathematics community comes from the regrouping of several existing communities dealing with computer manipulation of Mathematics. The oldest community is Artificial Intelligence in Symbolic Computation (AISC) which biennale conferences always had proceedings in Lecture Notes in Artificial Intelligence published by Springer. AISC's success gives rise to the Calculemus interest group which started as an European Community project of the fourth and fifth PRCD and has its yearly conferences which proceedings have often been published. Scientific themes of AISC and Calculemus gave rise to the MKM European Community project of the fifth PRCD. It is now organized as an interest group with an annual conference which has been published by Springer. The MKM community spread around the world and North American and Asian researchers among the most famous in the domain joined the interest group. Scientific themes of these three communities are relatively close and it was often the case that their members published or were part of the programme committee of several conferences. Starting in 2008, the three programme committees decided to hold their meetings in a common place in order to attract a wider audience and stimulate collaborations within their members. They thus decided to create Conferences on Intelligent Computer Mathematics (CICM). In 2009, the collaboration continued and in 2010, the organization is centered around these three conferences. Today, AISC is organized with a steering committee whereas MKM and Calculemus have an interest group carrying the conference. Globally, these communities have as members renown members of major research institutions working around Computer Mathematics. As an example, the ORCCA and Risc-Linz are the two biggest research centers in Computer Algebra. Members of Intelligent Computer Mathematics contributed to MathML norm of W3C which is the current standard for exchanging and spreading mathematical formulas over the Web.